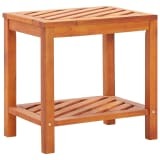 vidaXL Side Table Solid Acacia Wood 17.7"x13"x17.7"
Tables are available in many different shapes and sizes, and you can buy many tables online at vidaXL. A long dining table where you can enjoy a nice dinner with family and friends, a handy side table or a stylish coffee table; vidaXL strives to offer an assortment online as complete as possible. You will find several beautiful side tables made of high-grade wood, modern coffee tables and a large number of dining tables in our online furniture shop. When you’re looking for a new piece of furniture, whatever kind you need, it is very important that you pick a model that goes well with the rest of your interior. Solid wood is a very popular choice for material these days. There are many different kinds of wood, which makes them tables a good choice for both modern and traditional, rustic or antique interiors. Think of for example mango, oak or sheesham. Tables with a glass table top have a modern look and have the added benefit of easy cleaning. When you’re looking for a side table there are many different shapes to choose from, think of a square or semi-circular table for example. Another option for when you have guests over is an extendable dining table. When you're dinner is over, you can just fold it in again and save space. You can also find the perfect dining chairs to go with your table. You can easily combine different items together. Select a large rectangular or oval dining table and a round coffee table for example; because there is usually some space between both tables, you can create a nice effect in the room. The latest trends also make it possible to combine several smaller items together in favour of one large coffee table. This keeps your interior light and playful. Also have a look at our sideboards, which will go nicely with our dining table. When you are looking for something special for your interior you can choose to buy a design table. These are known for their unique shapes and combinations of materials and colours. At vidaXL you’ll find beautiful coffee tables that are hollow, with storage space, or have the shape of a raindrop. The round shapes give the whole a very soft look. Whatever product you order, we have free delivery on everything!